. 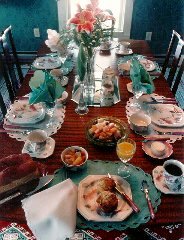 Enjoy the feeling the moment you step on the pristine front porch through your last bite of scrumptious breakfast, which guests describe as "an event to be savored..."
"It's hard to imagine a more perfect place for a romantic rendez-vous"... NY POST. According to TV's TRAVEL, TRAVEL ..."the charming Wood Duck Inn, is a destination in itself. Guests enjoy the quiet ambiance of Yesteryear." 1890 Victorian Bed and Breakfast, romantically restored, overlooking Dogwood Harbor, home of the last fleet of antique Skipjack sailing vessels in North America. Impeccably appointed with period furnishings, stunning oriental rugs & original art. Luxurious linens, fresh flowers & magnificent waterviews abound. You can do as little or as much as you desire. 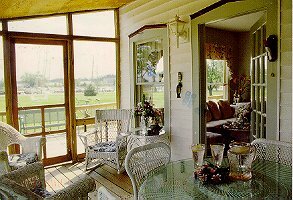 Relax with a cool drink on the veranda and watch to boats go by, or spend a winter day curled up with a good book by the crackling fire. Wood Duck Inn has a AAA 3-Diamond rating, and has been seen in Better Homes & Gardens, The Atlanta Journal, Washington Post, Country Inns, Mid-Atlantic Country, Philadelphia Magazine and numerious gulde books including Americas Favorite Country Inns & Bed & Breakfasts. Within walking distance of restaurants, shops & water activities. Swimming, tennis and golf available. Tilghman Island is a quaint fishing village, offering spectacular scenery, serenity & a forgotten way of life. 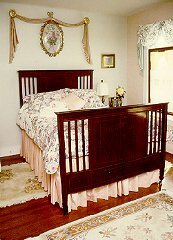 This and other Chesapeake Bay Bed and Breakfast Inns can be found here in The Register.